Check the bottom four corner pieces (Side 2) to see which are in the correct location to match up with the three adjacent middle-center pieces. Note that the pieces being examined need not have the correct orientation (matching colors touching), they need only be positioned correctly (correspond to the correct colors). For example, in Figure 2, the white-red-green corner piece is correctly positioned but not correctly oriented while in Figure 5 it is correctly positioned and also correctly oriented. Finding how many of the bottom four corner pieces are correctly positioned requires rotating side 2 (the white side) until two or four pieces are in the correct position. One of the four positions of side 2 will always have two or four pieces correctly positioned. Although you may see cases where one or three pieces are correctly positioned, you need to ignore those cases. Just keep rotating side 2 and you should eventually see at least two pieces in the correct position. Orient the cube as shown in Figure 2 where the two corner pieces in the correct position are at the front-top corners of the cube and the two corner pieces in the incorrect position are at the front-bottom corners of the cube. Perform Move 1, then proceed to step 3. In words, rotate the upper side (red here) one quarter turn counter-clockwise, then the front side (white here) 1/4 turn clockwise, then the upper side 1/4 turn clockwise, then the left side (yellow here) 1/4 turn counter clockwise, etc. If this notation is still confusing, click on Figure 2 to see example figures demonstrating the move. 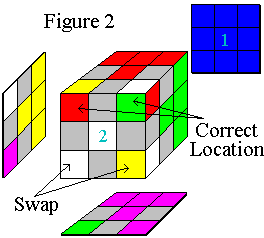 Orient the cube as shown in Figure 3, with side 1 in the back and either of the correctly positioned corners in the top-left-front and bottom-right-front positions. Perform Move 1, then go back to step 2, progressing to step 2a after correctly rotating Side 2 as instructed.